I’ve been to a lot of intense places on this planet. If you know my history, you’ll remember that I studied conflict in University. I made it a bit of a mission to try to understand what causes conflict. Beyond school, I’ve travelled to as many of these post-conflict regions as I could do, in search of trying to continue to observe and learn. 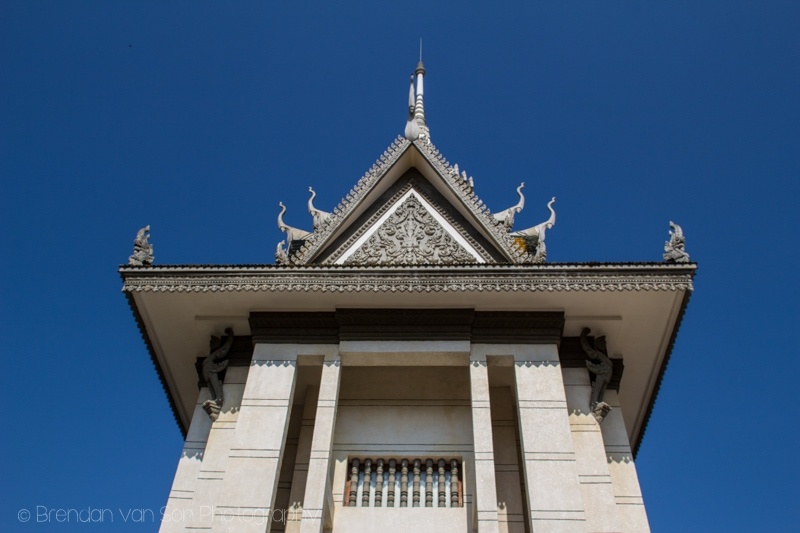 As such, a visit Cambodia meant that a stop at the Killing Fields at Choeung Ek in Phnom Penh was a necessity. It’s often hard to muster up an explanation of what it’s like walking into a place like this. Before arriving, you already know you’re meant to be sad. You know that you’re going to be demoralized, saddened and perhaps even lose hope for a second in humanity. Before setting foot in a place where genocide – the murder of hundreds of people – took place, you know exactly how you should feel. But still, there’s no preparing for the actually feeling, is there? 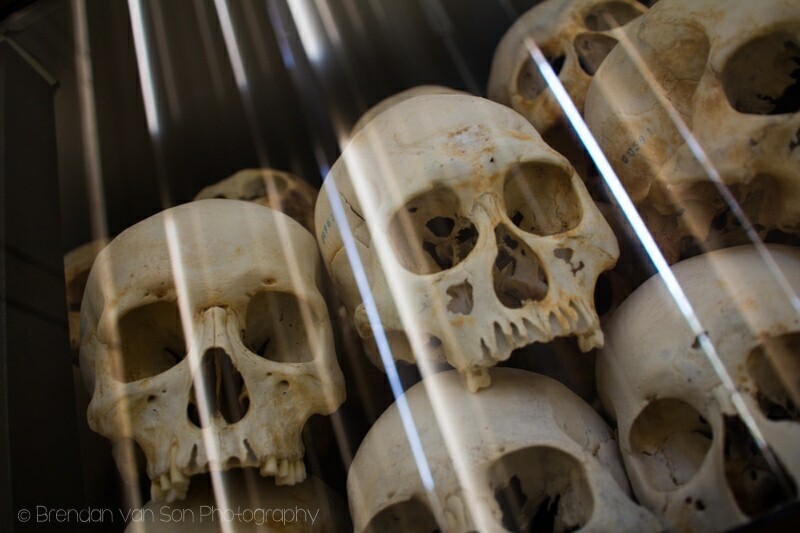 In many ways, visiting places like the Killing Fields in Cambodia as a tourist can make one feel guilty. It’s something that I feel more than anything every time I set foot in a spot like this. Calling it a tourist “attraction” hurts more than anything that could come out of my mouth. As a tourist, we almost feel like we’re taking advantage of the horrors of the past to impose a feeling that we’re doing something for the betterment of the planet. We feel guilty for visiting now, and we feel guilty that people just like us allowed this to happen, and continue to let things like this to happen around the world. But when it comes down to it, I don’t think of these places as “attractions” anymore. 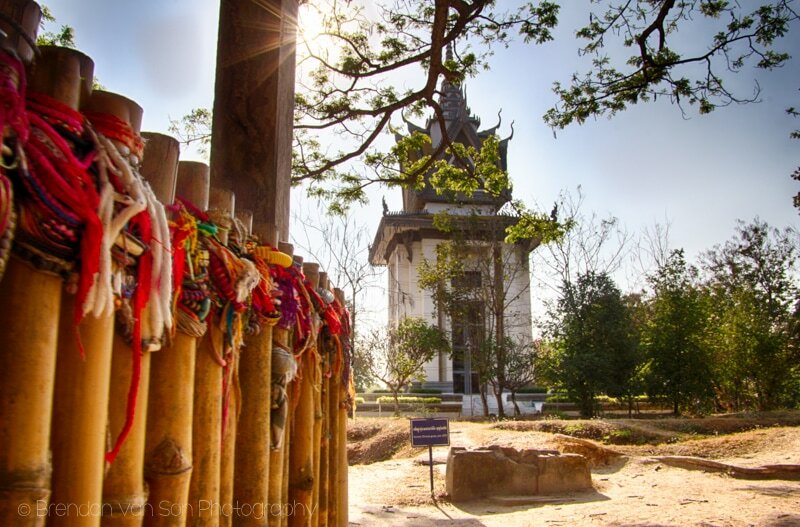 The Killing Fields at Choeung Ek isn’t a travel destination or an attraction, it’s a duty. As travellers, it’s not our right to visit places like this, it’s a show of respect. We don’t – or shouldn’t – come to these places for anything related to us. We do this to show respect for those who died, for those who fought for justice, and to try to find forgiveness for those who wronged humanity. We should visit the Killing Fields in Phnom Penh, and all places like it, to show people that the sacrifices of those who died will not be forgotten. People come to places like this every day and use the line “I’ve come to make sure that mankind doesn’t make the same mistake again,” but, is it not clear that the same mistakes are forged out constantly? They are happening right now, somewhere. And I’m not saying that you should go out and fight, lay down your life, but at least stop saying things like that to make yourself feel better. 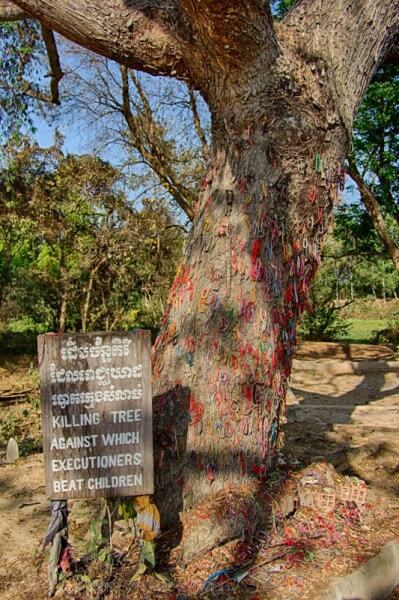 The Killing Fields are a lesson, but more than anything they are a place to show your respects. A tree… a tree that speaks for itself. 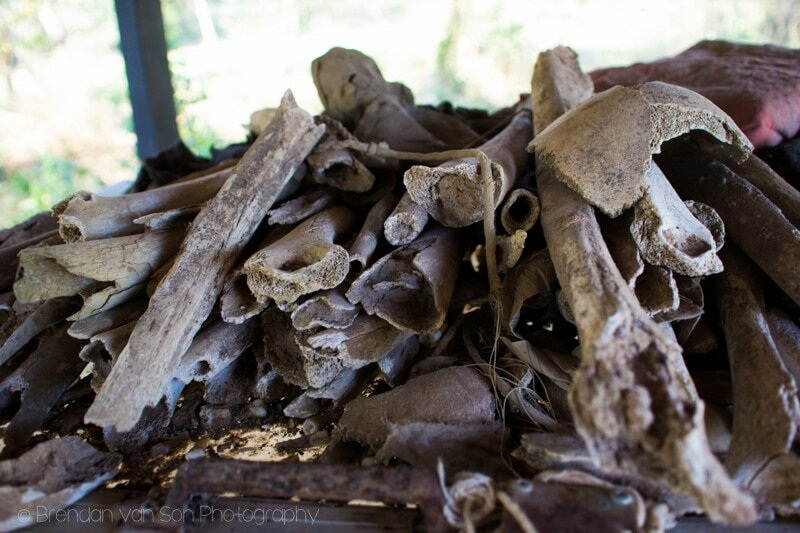 In the end, the Killing Fields are perhaps the most tasteful of any of these places I’ve ever been. There are no massive pits of bones left out to shock us, there are but a few more subtle symbols that force the impact to dive deeper into our minds – a tree full of coloured bracelets which children were bashed to death against, some torn clothing and bone fragments in a green grass field. The Killing Fields are a quiet place, too. Tourists wander with their audio-players: listening without saying a word. And it’s obvious in their eyes that the impact has been felt. It’s obvious that no matter what they expected to feel before they came, and no matter their reasons for coming in the first place, they understand why they are there now. I have been few places, no matter how dramatic, where the show of respect was so beautifully painted on the faces of those who were visiting. Well said. When I visited Choeng Ek it was a mixture of emotions: all bad. As an American I was outraged that the actions of our military enabled this to happen. As a human I was ashamed that my species is capable of such outrages. As a citizen of the world I am astonished at how few people even know of the loss, in our lifetime, in Cambodia. I lived in Cambodia for nine months. It still shakes me when I think about the friends I made and the grace and forgiveness they are capable of showing. Educate the world and never let them forget. NEVER again in my name. Great write up on this place. We decided to do the Killing Fields and the Genocide Museum in the same day. We knew of the atrocities that took place during the Pol Pot regime, but nothing could prepare us for the way we felt while we were there. Many people have no idea who Pol Pot was and so many people don’t even know of the Cambodian Holocaust. The media was not allowed to come in and report what was going on. These memorials are reminders to people of the bloodshed that took place but they still happen to this day. I totally agree that visiting places like this should be considered a “duty” by travelers. They aren’t easy or “nice” to visit, but I think they are an important aspect of travel, especially when it comes to understanding the places we visit and the people we meet. I haven’t visited this place but I have been to Auschwitz. We were visiting Krackow and I knew that I had to make the trip to the camps, not because I particularly wanted to be depressed, or that by doing so I could make a difference to anything that is happening currently but really as a duty and out of respect to the people who died there and the men and women who died defeating the system that created these camps. Exactly! Glad you went, Ian. I hope to pay my respects at some point as well.